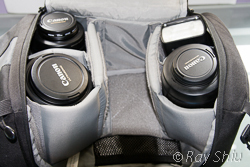 Finding the right bag for your precious DSLR(s) is never an easy decision. There are so many different choices such as size, capacity, carry style, brand etc. Even if you're brand loyal, there are different specs to similar bags not to mention color. We have a bag section HERE that we hope will help you out. The Lowepro Slingshot 200AW is the middle offereing of the Slingshot series. Capable of carrying a body+lens in the quick draw position and up to 4 additional pieces of equipment (depending on size). There are belt loops in convenient spots on the bag to attach modular pouches and the material is drizzle proof use the built in rain cover for down pour protection. We have a few more photos of the Computrekker on our Flickr page HERE if you're interested to have a look. The equipment in the bag are tagged (in the Flickr set) so you can get a better idea regarding sizes. This bag is for budding enthusiasts who have a lens or two and a speedlight or two. It is great for a quicker camera draw to get the shot as opposed to having to set your backpack down to get your camera out. Or a more discreet photographer not wanting their camera dangling from their body while they are walking around. Being able to swing the bag, unzip, get camera and shoot takes but a few seconds. The rubbery loops on the bag are just large enough to slip in a Gorillapod or a smaller monopod but be weary of the weight on one shoulder. 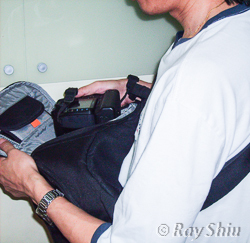 As this bag is too small for pro sized gea, this bag is used as a quick grab and go bag for a day of casual shooting. Most often it is used as the "3rd option" bag meaning a complete backup system is in there ready to go or to be used by another shooter. The cross shoulder strap when used helps to prevent the bag from slipping off my left shoulder when the right shoulder gets tired/sore. The size and form factor are just right for a days outing. Fitting a body+lens, extra lens, flash and accessories comfortably in the main compartment, the top of snack or a wind breaker type jacket / rain coat. 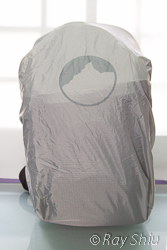 Built in rain cover on the bottom of the bag (when standing upright) also provides a bit of cushion. Getting you camera out of the bag and ready to shoot is not that quick a process. I think a messenger style bag would be quicker. When pulling out the camera, if your lens is a zoom that extends, the snugness of the bag (the way I have it set up) always pulls the zoom out. Unless I have the lens locked (only the 70-300 can). It's really a pain when trying to quickly get a shot off. I just love the "rain coat"! It's attached to the bag so no worries about losing it. It works really well. If you're a shooter in the tropics, you know that it can rain at any moment making this feature a must have. I haven't come across any messenger style bag with a built in rain cover. 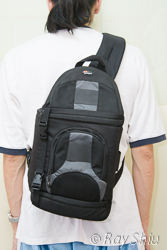 After using this bag for a few years, the nicely padded shoulder strap as gotten hard and uncomfortable to use. Chalk this up to wear and tear. 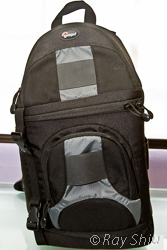 For a casual shooter not using pro gear, this bag will suffice as the gear tend to be smaller and lighter. Makes a good quick grab and go bag.